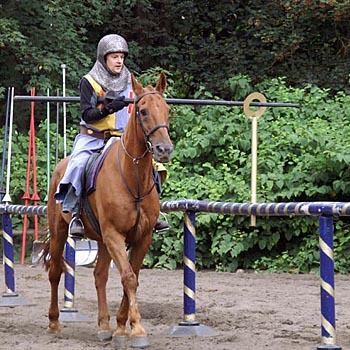 This joust experience is an all action, fun and thrills journey back in time to the Middle Ages when men were men, horses were horses and the Black Knight was the one that everybody wanted to knock off his horse. This fantastic action experience is every bit a fun-packed day of being a kid again and doing all those things you never actually got to do when you were a kid but always wanted to. Anyone who’s heard of Robin Hood or King Arthur will have longed to try their hand at jousting. Or broadsword fighting. Or longbow shooting. And with this fantastic all action adventure experience, now you can be transported back to the Middle Ages and take part in all the deeds of derring-do that you’ve seen on TV and in the movies. And the good news is that you don’t need to be a man to do it. Women are welcome to try their hand too – the only qualification is that they enjoy a cracking good, fun-filled all-action day out. As you’d expect, these jousting experiences are hard to come by, but we’ve pulled them all together for you in one place so you can compare prices in real time and be the first to see any special offers or price reductions. But be warned, these experiences are in such demand that they fill up very quickly and we’ve not seen any big price reductions in all the time they’ve been around. Well we bet you’re wondering what goes on when you buy one of these Medieval adventures, whether you really do get a go at the dreaded Black Knight on a horse, with a lance, even if the nearest you’ve got to a horse before is a donkey on the sands at Mablethorpe. What kind of jousting experiences are there? There are actually only a couple of these experiences as we go to press: there’s a short one taking a couple of hours on farmland near Welshpool, and the other one is a full day of chivalry near Warwick. They’re offered by a number of different experience providers, so our considered advice is to check out the details, pick the one you want and buy it from whoever is cheapest at the time. We’re reviewing the full day experience as it’s more centrally located in Warwick and gives you enough time to go into chivalry and the arts and secrets of jousting and medieval fun, and to really get into the part. The shorter experience is fine if you’re nearer to Welshpool, and is a fine jousting experience on a budget, but you might not find it long enough and we’d expect to see you wanting more when it’s over. Do I need to be a good horse rider? When you arrive at your jousting and chivalry centre, you start off with the essential safety briefing, and your skills as a horseman/horsewoman are assessed. But rest assured that no real horse-riding experience is needed to take your part as a knight in this jousting experience, though it might be an advantage for certain of the activities. For safety reasons if the instructor on the day feels that you aren’t a good enough rider for certain tasks, you’ll more than make it up in the other activities. Jousting isn’t like racing at Ascot and doesn’t need that kind of skill with horses, and believe us, those old warhorses can put up with any any standard of horsemanship ability, even yours! All the people who will be training you at the tournament centre are experienced riders and actors, and you’ll find them more than willing to help and encourage you, so you should have a fantastic jousting time whether you’re a rider or not. So what actually happens on your jousting day? Well early on in the day, there’s a fascinating introduction to chivalry and medieval fighting to give you the feel of the Middle Ages and an insight into jousting, broadsword fighting, combat with quarterstaffs and longbows too, giving you the chance to travel right back in time. You’ll meet your horse of course, and he (or she!) will be a trusty steed in all senses of the word, having ridden to combat many times with all kinds of rider, which you’ll find a great help when it comes to jousting for yourself. Imagine holding a lance and riding to hit targets, pick up rings, or even assault the dreaded Quintain which is that little target mounted on a revolving horizontal pole, which comes round to smack you on the back of the head if you’re not quick enough to get out of the way. You’ll be able to have a go then at trying to unhorse the infamous baddie the Black Knight, and even take part in a real tournament against your fellow course members (up to about 20 in all, so there’s quite a sense of fun and camaraderie develops over the day). Other activities you could be trained in and practise to test your skill are fighting with the two handed sword that the knights used to chop their opponents to pieces, quarterstaff combat as seen in the famous struggle between Little John and Robin Hood on the log spanning the river, and even target practice with that most deadly of medieval weapons, the longbow of Olde England. As you’d expect, in your action-packed adventure day, there may not be time to spend all the time you want to at all the activities you want to do and still fit in unseating the Black Knight, so the activities could vary on the day according to what you want to do most of. In summary, this jousting experience is a day packed with fun, camaraderie, adventure, fascinating insights into the real Middle Ages, with a real horse. You’ll dress the part, feel the part, and have a day to remember long after the Black Knight has been unhorsed and the weapons have been put away. We’d advise you to take someone to be in charge of the photography and video, as your mates won’t believe the fun you had and things you did without seeing it for themselves on Youtube. And a word of warning – wear your old clothes as in days of old when knights were bold before Gucci was thought of, they quickly discovered that chivalry and horsey combat is a bit of a dirty job! Who do you know that would love to play Knights in Armour? Yes, we thought so, there are lots of men, and some women too, that you can just picture having the time of their lives living out the Middle Ages for a day. So why not surprise them with this superb all action experience as a gift for that birthday, Valentine’s day, anniversary, or indeed for no occasion other than the fact that you’d love to see them have a brilliant time and it’s a surprisingly cheap experience.